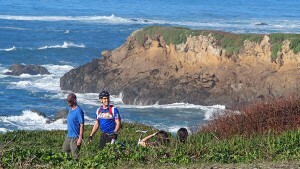 Enjoy a historic moment with your friends and family as the Fort Bragg Coastal Trail softly opens on January 31. Experience the luscious views which have been unavailable to the public for over 100 years. While the parking lot will be open and fences taken down, repairs are still needed to the cable stairs to the beach, so people are asked not to circumvent that barrier. Mendocino TV recommends that restroom facilities are added to both ends of the trail. While there is currently a portable potty at the beginning of it, there is a need for facilities on both ends. Additionally, we request that bicycle riders equip themselves with a bell or otherwise alert pedestrians they are approaching as we witnessed several near misses. There is a gravel surface bike trail alongside the paved trail that bikers should use and people walking need to stay off of. Take advantage of this glorious weather and experience Fort Bragg’s new jewel for yourself.